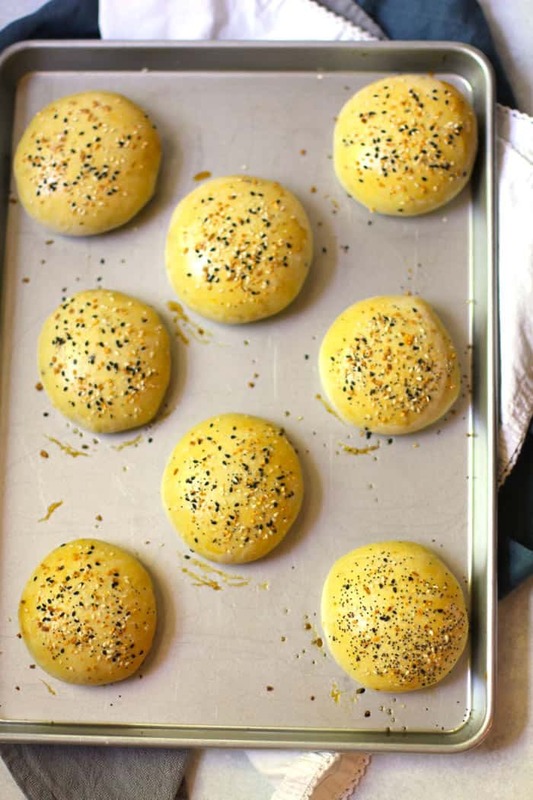 Everything Bagel Rolls make a great sandwich bun for your burgers and deli meat, or go ahead and smear them with butter or cream cheese. The texture is soft inside with a crunchy, savory top. When my oldest son was in middle school, I packed him a sandwich with a homemade bun every single day. It wasn’t this exact recipe, but it was soft and delish too. My younger son preferred his crackers and cheese, and so I just had to make sure I had five homemade buns for each week. It makes me smile now, because I know how much Josh enjoyed this treat, and he also bragged to his friends at the lunch table and told me their reactions afterward. Such a sweet memory. I’m a lucky girl to have been able to stay at home for most of their childhood, and now that we have an empty nest, I appreciate it even more. We don’t eat as much bread anymore, so I truly love an occasional bread-making day. Texas has the perfect climate for it, and I’m still surprised at how quickly the dough rises on certain (warm) days. 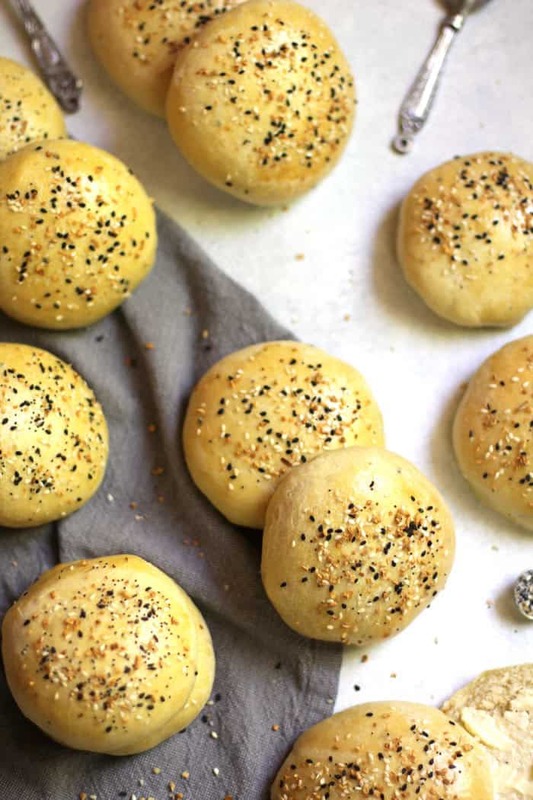 Tips for making epic Everything Bagel Rolls. The dough shouldn’t be overly sticky when ready. It should bounce back slightly to the touch. 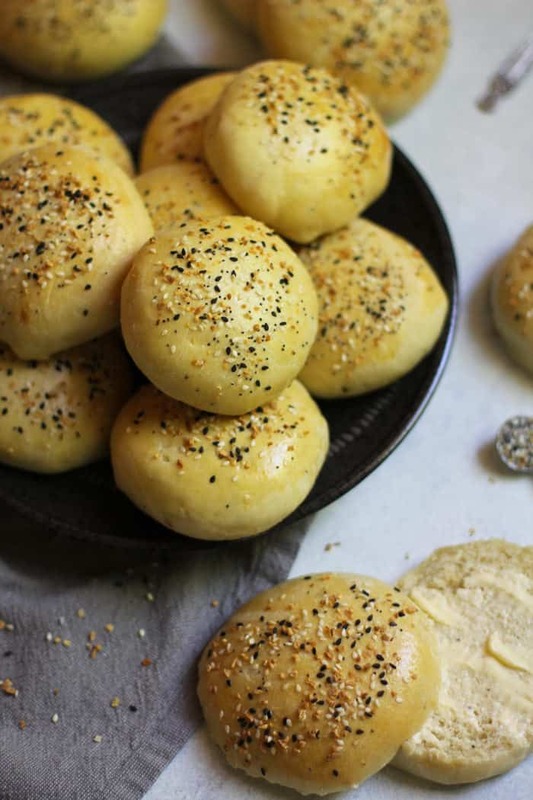 Over time, you will learn exactly how much flour is needed to make the ultimate rolls. 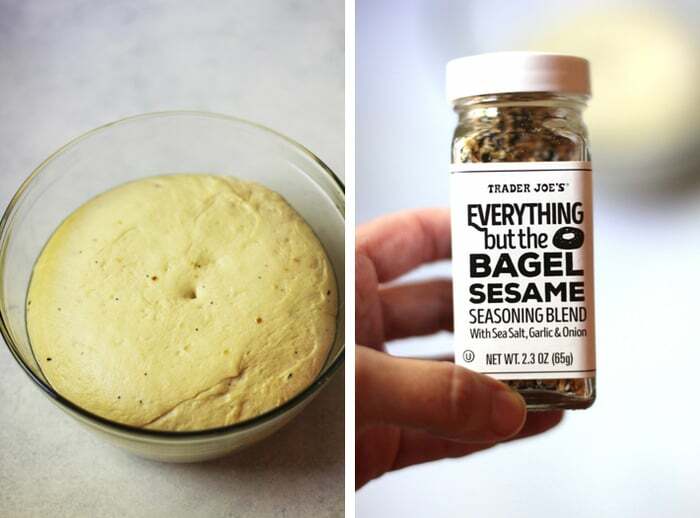 Add one tablespoon of the Everything Bagel Seasoning to the dough. Then the rest is sprinkled on top before baking. Be sure to use an egg wash before baking. This is what gives the rolls a nice golden color. Most of my bread recipes use oil for the fats. However, this one uses butter to create a richer taste. I also used an egg to help develop a soft texture. Backyard Barbecue Season has just about ended for some of you, but we’ll still be enjoying it for several months here in the south. 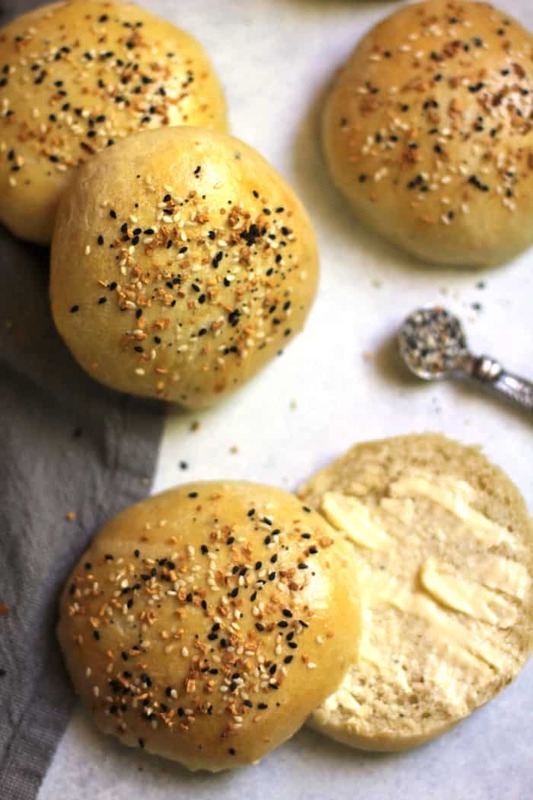 These rolls are perfect for burgers, or for just a deli sandwich. My youngest happens to like them with a big smear of cream cheese, sort of like a bagel sandwich. However you decide to eat them, they’ll be delish! 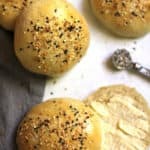 Everything Bagel Rolls make a great sandwich bun for your burgers, deli meat, or go ahead and smear them with butter or cream cheese. The texture is soft inside with a crunchy, savory top. ** Make sure you read my tips in my blog post! In large standing mixer, combine the yeast, sugar, salt, one tablespoon of Everything Bagel Seasoning, and warm water. Be careful to use warm water, not hot. Mix and let sit for about 15 minutes to get the yeast working. The mixture should be foamy or bubbly. Add melted butter and one whipped egg, and stir to combine. Gradually add 5-6 cups of bread flour until you get just the right consistency. You want the dough to be soft but not too sticky. Let the dough rise until doubled in size, about one hour (depending on the climate where you live). Punch down and smooth it out, and let it rise again, about 45 minutes. 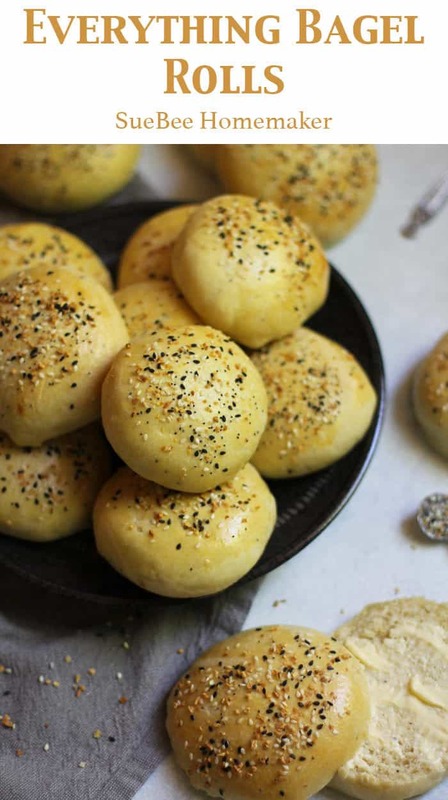 Form dough into buns. Place on large greased cookie sheets. Cover with a towel and let rise again, about 30 minutes, or until roughly doubled in size. Whip the remaining egg and brush on top of buns. Sprinkle liberally with the Everything Bagel Seasoning on top, adding plenty because some will come off. Bake on 375 degrees for 15 minutes or until bottoms are slightly brown and crunchy, and top is nice and golden brown. Remove and let cool on baking rack. These rolls freeze well in a freezer bag up to three months. Sue has the best bread recipes. Try them all!